This handcrafted box was painted by established Palekh artist, Gunina Olga. The scene exudes her professionalism and the coloration invites the eye for permanent residence through appreciation. 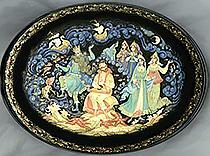 The box features a scene from the Russian fairy-tale of Sadko. Here we can see a moment when the Sea King offers Sadko to choose any of his beautiful daughters, and marry this girl. The scene is complex and multifigured. It combines the figures of Sadko, the Sea King, his five daughters and dozens of various water plants and fishes. Shining gold and silver paints applied with a very thin brush fill the scene with a magic splendor. Gold and aluminum is also used to decorate the box's exterior with beautiful patterns. The box is made out of paper-mache. Black lacquer covers the exterior and red lacquer covers the interior of the box. The lid is hinged from the top of the scene, and the box rests flat. The work is signed with the artist's name, dated (2016) and the village of Palekh.